"More fun than a muddy puddle! 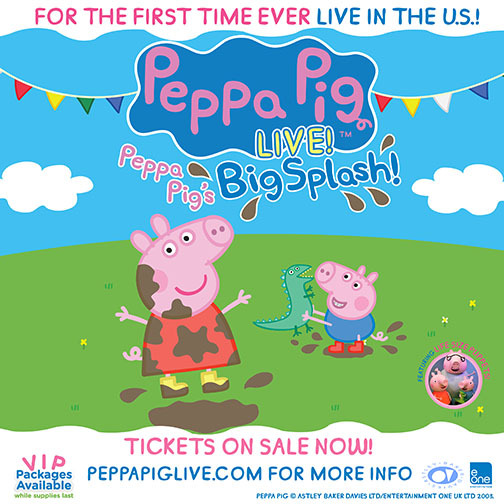 On the heels of strong U.S. ticket sales for its first leg of tour dates, and by popular demand, an additional 65 cities and 100 performances have been announced for Peppa Pig’s first-ever U.S. theatrical tour, Peppa Pig’s Big Splash. Peppa Pig, star of Entertainment One’s (eOne) top-rated TV series, airing daily on Nick Jr., and her all-new live stage show will visit more than 90 cities starting this November. The tour is visiting some of the highest-profile theaters in the country, including the Beacon Theatre in New York City (three shows), Microsoft Theater in Los Angeles (two shows) and the famed Ryman Auditorium in Nashville. Tickets for the spring 2016 performances are on sale beginning Saturday, September 19. Citi® Cardmember and Facebook presale tickets, as well as “pink carpet“ VIP packages that include a meet and greet, will be available September 16 at 10:00 a.m. Citi® Cardmember Preferred Tickets and general public tickets are on sale beginning September 19. Fans can purchase tickets and find more information at www.peppapiglive.com. series, designed to deliver to preschoolers and young fans an unforgettable first live theater experience. 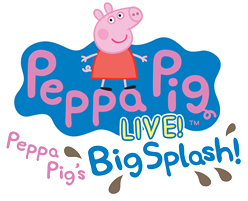 A fully immersive musical production featuring a dozen familiar and original songs, as well as an interactive sing-a-long, the live stage show will have fans laughing, singing, dancing and of course jumping in muddy puddles too – just like Peppa. Peppa Pig’s popularity continues to soar in the U.S. Families are flocking to major retailers nationwide, including Toys“R”Us, Walmart and Target, where hundreds of Peppa products have taken over shelves. Peppa is also a star on social media, connecting each day with her more than 2.5 million global followers on Facebook alone. exuberant little piggy who lives with her brother George, Mummy Pig and Daddy Pig. Peppa’s favorite things include playing games, dressing up, spending days outdoors, and jumping in muddy puddles. All episodes are wholesome entertainment for the entire family; Peppa’s adventures always end happily with loud snorts of laughter. Peppa Pig episodes are available on DVD, and for download on iTunes and Amazon Instant Video. For more information about Peppa Pig, please visit www.peppapiglive.com, Facebook and Twitter. The kids in the family would love this one but they aren't coming anywhere close to our location.